Let’s get something REALLY clear. When someone says they “respect your choices” as a fat person, but continues to publicly vilify fat people in general… they actually DO NOT respect anything about you. I know! It’s a bit of a bombshell, isn’t it? Public persona is published in the media talking about how unhealthy/sedentary/uncontrollable/irresponsible/costing the taxpayer fat people are and how society needs to take control/shame/tax fat people to make them “wise up” to the ZOMGBESITY CRISIS! I’ve said before, the problem we have here is that these people are not listening to us. Oh they might be hearing the words, but they are not actually listening to what we are saying. They’re not hearing that their words and actions are harming people. They’re not hearing that they are hindering us, not helping us. Whether this is because they don’t want to hear these things, or that they just cannot fathom that there is a disconnect between what they are pushing and reality or it is because they’re too horrified at the thought that they might have to be responsible for the things they say that harm people, I don’t know. But I do know that when we see this pattern over and over and over, it is because we are not being listened to. The abolitionists may well call me their equal, but their lips do not yet say my name, and their ears do not yet hear my story. Not the way I want to tell it. But I have long loved the written word, and come to see in it the power of the sleeping lion. This is my name. This is who I am. This is how I got here. In the absence of an audience, I will write down my story so that it waits like a restful beast with lungs breathing and heart beating. Is that not the most beautiful paragraph? I am struck with the thought that despite this being the words of an African woman sold into slavery over 200 years ago, it rings true for many marginalised people even today. How many people SAY that they consider us their equal, be we women, fat people, people of colour, people with disabilities, queer people or any other marginalised people, but yet they do not hear what we are saying, and cannot even identify us individually? To how many people are we still the obese, the disabled, the homosexual, the blacks, etc, rather than people, their true equals? While I would never compare my life to that of the character of Aminata Diallo from Someone Knows My Name, I too have long loved the written word, and understand it’s power. I too believe that while people are not listening to us now, we can write our stories, share our experiences and talk about how we are affected by the behaviour of those who see us as “other”. The more of us who do so, who put down our stories somewhere for others to read it, those stories accumulate and grow in power. And they will also provide a record in later times, when people start to understand the damage being done now. That while there may be many who do not listen to us now, we are reaching those who do, and by telling our stories we reach even more, and leave a legacy to those who follow us. After all, marginalised people have spent their whole lives listening to those who oppress them. We’ve had no choice but to do so. Ok Heffalumpies, I need to put my ranty pants on, so brace yourselves! Y’all know I bought a Thermomix a month or so ago right? Well I did, and it’s awesome. I have a lasagne cooking in the oven right now that took me about 20 minutes to put together, INCLUDING cooking both the bolognaise and bechemel sauce from scratch. That puppy is going to feed me for about a week. Anyway, I’ve been following quite a few Thermomix blogs, forums and Facebook feeds since before I bought it, and so far they’ve been fantastic and very inclusive, with no judgment about weight or food or eating, but lots of great recipes, from the ultra efficient tummy fillers to delicious indulgent treats. I’ve really loved that about the Thermomix community, that I’ve felt included even though I’m a big fat person! Trigger warning on that article lovelies, there’s a headless fatty on there and a whole bunch of fat hate. I’ve redacted the name of the “chocolate appetite suppressant” because I’m not giving that stuff any promotion. So I left a comment and asked could they please keep it to cooking/Thermomix and not bigotry against fat people, because fat people both a) have Thermomixes and b) read their blog. I also talked about my eating disorder past and how my Thermomix has been instrumental in helping me learn to eat competently and reclaim my right to enjoy cooking and food. 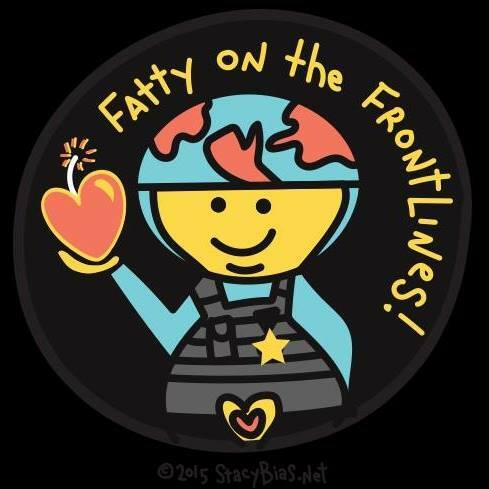 Fat people don’t need chocolate appetite suppressants, we need to be able to live our lives without stigmatisation and shaming, and to find the healthiest ways to feed and move our bodies as they are, and not hold off on life “until we lose weight”. I also sent them a link to my earlier post about the topic. Well, you can imagine how speechless I was to receive a response offering me a sample of the “chocolate appetite suppressant”!! This is akin to offering a recovering alcoholic a drink, or a recovering drug addict a shot of heroin. It is both irresponsible and tactless, and actually, it’s dangerous. I’m one of the lucky ones, I’m well enough down the road of recovery that I can say no, and do so without being triggered horribly. The first signs of theobromine poisoning are nausea, vomiting, diarrhea, and increased urination. These can progress to cardiac arrhythmias, epileptic seizures, internal bleeding, heart attacks, and eventually death. Now if someone has admitted to you that they have a history of abusing appetite suppressants, are you going to suggest they try something that if abused, can lead to the above? I should hope not. It’s like handing an addict a loaded needle. It goes to show that people shilling these products really don’t care. They don’t do the research, they don’t listen to people and they don’t take responsibility for how their snake oils might be abused by vulnerable people. How I didn’t tear them a new orifice in my response email, I don’t know. My God, am I actually learning restraint??? Say it ain’t so Heffalumpies! Needless to say, I’ve removed that particular blog from my RSS reader, unliked their page on Facebook and will be avoiding them like the plague. How many years of your life did you put into trying to be thin? How much of your life did you put on hold while you tried to be thin? How old were you when you first remember being told you were fat? How many exercise “plans” have you been on? How many years of your life have been taken up with eating disorders? How many people have told you that you are fat? How many people have treated you badly because you are fat? How many years did you spend counting calories, watching the number on the scale or the size label on your clothes? Now tally the sum of all those years, all that time, all those diets, all those times you made yourself sick in the effort to get thin, all the punishing exercise regimes, all the hurtful experiences add all those numbers together. Don’t you think the fat haters should invest the equivalent amount of time, the same number of years, in trying as hard to be a decent human being, as we fat people invested in trying to be thin? Fat people are not the ones with the problem, or who are in denial. Fat people are not in denial of being fat. We know we are fat, and in choosing fat acceptance, we accept ourselves exactly as we are, and we accept others exactly as they are. You can let go of all those numbers now. Set yourself free of the pain that those numbers represent. You’re off the hook – you’ve done your part. Close your eyes and imagine that all those instances of trying to be thin, or being bullied and shamed for being fat are balloons, filled with helium. Imagine them in your hand, bobbing above you, all different colours. Now open your hand and let them all go. You don’t have to carry them any more. This isn’t giving up. This is letting go and deciding that YOU control your life, not other people who feel they have the right to judge you. This is about deciding to live your life to the fullest you can. People who think that fat people are somehow worth less as human beings as thin people, that fat people deserve to be shamed, discredited, their experiences denied and generally just shamed and bullied for being fat are the ones who have the problem. They just can’t get on with their lives and let people be who they are, as they are. We are not the ones in denial, it is the fat haters that are in denial. Denial that they are in fact… arseholes. *Post inspired this post by Ragen of Dances with Fat. If You Could Magically Become Thin Overnight, Wouldn’t You? Hands up if you’ve had this question. If you’re a fat activist I’d say the likelihood is pretty high. I hear it pretty regularly myself. It’s usually followed by “Of course you would!” before I even get the chance to respond. Which tells me from the outset that my answer to the question was actually irrelevant, since I wasn’t even given the opportunity to answer for myself. The thing is, it’s a redundant question. There IS no magic way to become thin, either overnight, in a week, a month, a year, a decade. The asker assumes that the concept is really worth entertaining because they believe that if I really, really wanted to, I could become thin. But I know, and it’s becoming increasingly documented in science, that no matter how much a I could possibly want it (if I did), I can no more become thin than I can become a unicorn, the President of the United States of America, or marry Hugh Jackman. Well, there is an outside, remote, very distant chance I could marry Hugh, but even that is more of a likelihood than my becoming thin. However, there are some things I would like to happen, and I do believe are possible right now, without any magic, is for people with fat bodies to be treated with dignity and respect. For our bodies to exist without being treated as objects of derision, fetish or ridicule. And for fat people to be allowed to live their lives without the intrusion of strangers and the general public on our own private matters, such as health, sexuality and comfort. I would like to see all bodies, regardless of their size included in all aspects of life. I would like to see all bodies included in public spaces, on transport, in education and health without moral value being attached to them. I would like all bodies to have access to clothing, furniture, safety gear and sporting/recreational equipment equally. But most of all, I would like to see people in general focus on the wellbeing of their own bodies, rather than intruding on the wellbeing of other people’s – even fat people. This is what could happen, without “magic”, and without wishing for something that is simply a fairytale.